No matter the time of year, storage space is always in high demand, especially in residential areas. Despite shrinking square footage, residents still need somewhere to store their outdoor gear, tools, supplies, and other items not stored in the home. 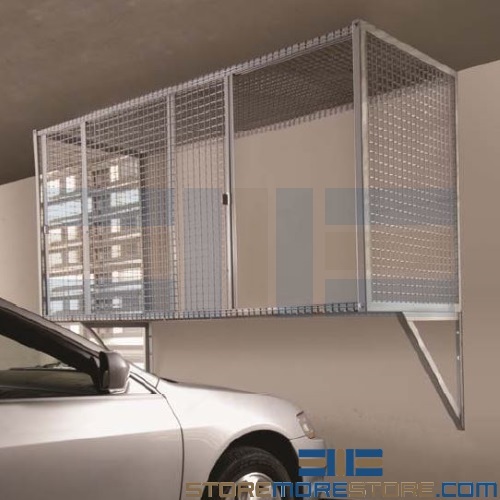 Parking space storage lockers are an ideal solution that provides storage without actually taking up floorspace because it mounts above parked vehicles. 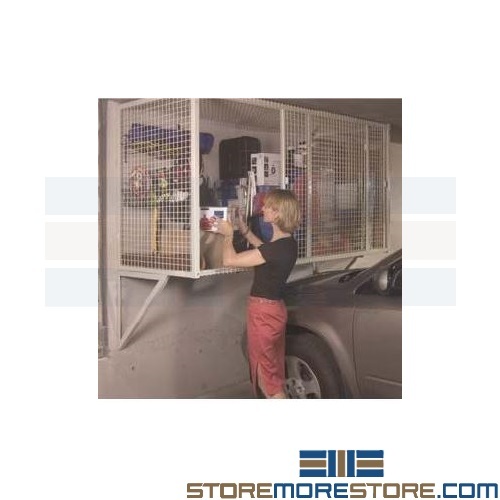 This also provides a great opportunity to increase property revenue at your facility because nowadays, potential residents often view storage space to be as valuable as a pool or gym. For example, you can increase your value by allowing residents to rent the parking space and the storage locker. Additionally, the parking space lockers are available with multiple options depending on your residents’ needs. Also choose from solid steel or perforated panels for additional ventilation and standard key locks or digital locks to keep stored items secure. 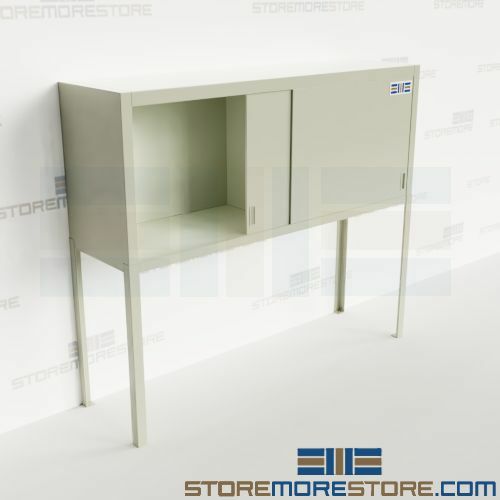 The lockers also include an intermediate shelf that can be placed wherever it’s needed. With the parking space lockers, you can give your residents the storage space they need without spending a fortune on real estate. 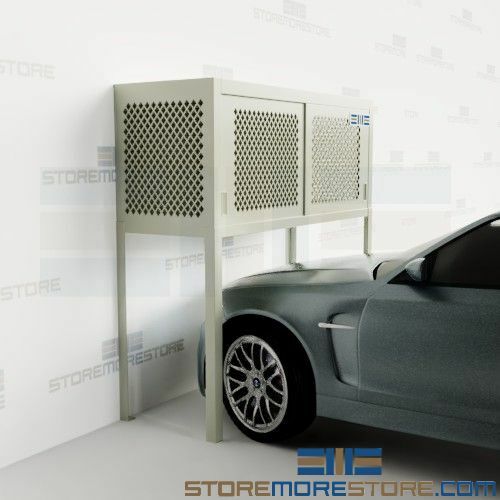 Parking space storage lockers are available to buy online and ship within 5-7 weeks with free dock-to-dock shipping included. If you need any assistance or just want some help picking the right solution for you, please call us at 1-855-786-7667. Package delivery lockers provide 24/7 anytime parcel pick-up and drop-off with automated alerts that notify recipients. This is a great delivery storage and pick-up system for apartments, condos, universities, large offices, and other businesses. With automated tracking and secure user access, the package delivery lockers virtually eliminate the need to manage individual keys. Thus, you have more time and resources to spend on other tasks in your facility while recipients can be certain of their delivery’s security. For package drop-off, simply place the package in an empty locker compartment. Then lock the door with a 4-digit PIN and text or e-mail the recipient with this number and locker assignment. When the recipient picks up the package, they simply enter the PIN into the assigned locker to access it. Since there are no keys required, staff members don’t need to spend time managing and tracking individual assets. And since there is also no need to ensure staff is available at all times, users can retrieve their deliveries at their closest convenience. The 24/7 access makes the lockers a great system for busy tenants and university students. With more and more people working outside of the typical 9-5 schedule, ease of access is especially important. 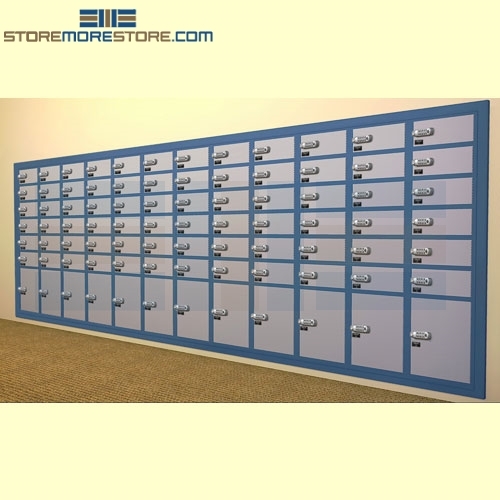 Lastly, you can install the lockers as a standalone solution or install them through your existing walls. Additional package delivery locker features are included below. 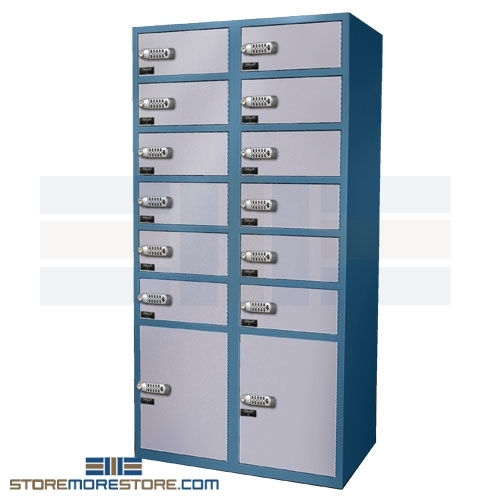 Package delivery lockers are available to buy online and ship fully assembled. If you need any assistance or just want some help choosing which configuration is right for you, please call us at 1-855-786-7667. Bicycles are a pain to store. They take up space and are difficult to retrieve if they’re disorganized and stored incorrectly. 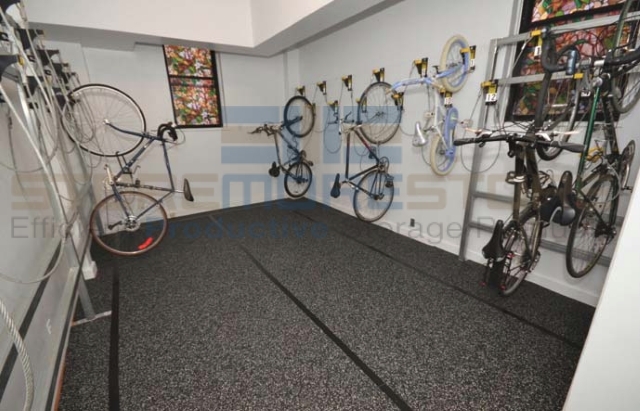 Wall mounted hanging bike hooks eliminate this problem by storing them on the wall instead to prevent cluttered storage and provide a cleaner look. 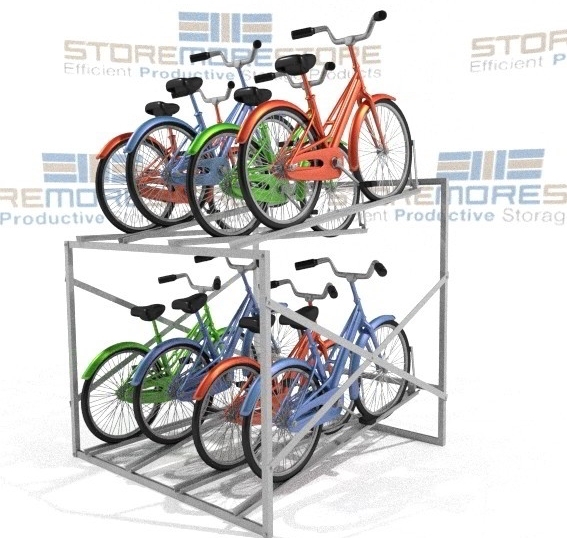 Retail stores and apartments are especially fond of this option since it provides a neat display and allows residents to easily store their bikes without stacking or hastily piling bikes on top of each other. 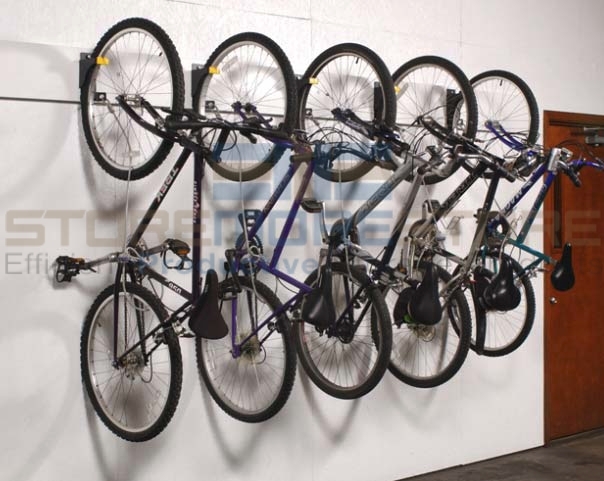 Instead of taking up floor space, the wall mounted hanging bike hooks store bikes vertically on the wall. This allows you to make more room for your storage without the high cost. 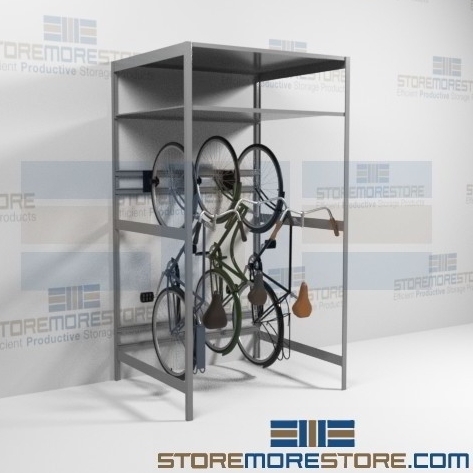 Made of heavy-duty 11 gauge steel, the hooks are capable of storing any bicycle and stand up to the wear and tear of everyday use. The hook projects 5.25″ from the base and includes a vinyl covering to prevent scratching and protect the bike’s finish. Two pre-drilled holes are included for easy wall mounting. For extra security, users can also supply their own padlocks. Wall mounted hanging bike hooks are available to buy online and ship in 7-10 business days. For more information or if you need additional assistance, please call us at 1-855-786-7667.